100% natural, effective relief of respiratory ailments, colds, wheezing, and sniffles in dogs and puppies caused by congestion or allergies. VetRx™ helps control sneezing, nasal discharge and noisy breathing. It is also effective against mites and ear cankers. For use in all breeds of dogs and puppies. For the best results, use VETRx™ warm. Put the bottle in a container of warm water and let it stand for a few minutes or warm quickly over medium heat with the spout in an open (upright) position. Always test the temperature of the product before applying. Apply two (2) drops directly into each nostril for adult dogs, one (1) drop for puppies. Repeat in five (5) minutes. Repeat the application three (3) to four (4) times a day. 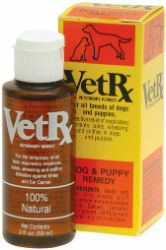 If possible, isolate the pet and treat with VETRx™ in a warm water vaporizer, following the manufacturer's directions. Keep in a cool place out of sunlight.